The Battle of Shanghai was the first of the twenty-two major engagements fought between the National Revolutionary Army (NRA) of the Republic of China (ROC) and the Imperial Japanese Army (IJA) of the Empire of Japan at the beginning of the Second Sino-Japanese War. It was one of the largest and bloodiest battles of the entire war, described by westerners as "Stalingrad on the Yangtze". Since the Japanese invasion of Manchuria in 1931 followed by the Japanese attack of Shanghai in 1932, there had been ongoing armed conflicts between China and Japan without an official declaration of war. These conflicts finally escalated in July 1937, when the Marco Polo Bridge Incident triggered the full invasion from Japan. Dogged Chinese resistance at Shanghai was aimed at stalling the rapid Japanese advance, giving much needed time for the Chinese government to move vital industries to the interior, while at the same time attempting to bring sympathetic Western powers to China's side. 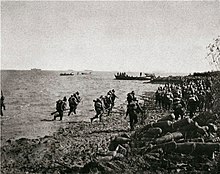 During the fierce three-month battle, Chinese and Japanese troops fought in downtown Shanghai, in the outlying towns, and on the beaches of the Yangtze River and Hangzhou Bay, where the Japanese had made amphibious landings. 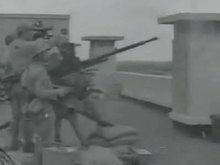 The Chinese soldiers had to rely primarily on small-caliber weapons in their defense of Shanghai, against an overwhelming Japanese onslaught of air, naval, and armored striking power. In the end, Shanghai fell, and China lost a significant portion of its best troops, while also failing to elicit any international intervention. The resistance of Chinese forces, however, shocked the Japanese,[clarification needed] who had been indoctrinated with notions of cultural and martial superiority, and dramatically demoralized the Imperial Japanese Army. On 9 August, Lieutenant Isao Ōyama (大山勇夫) of the Japanese Special Naval Landing Forces came speeding in a car up to the gate of Hongqiao Airport. As he was stopped by a Chinese guard, the lieutenant attempted to drive past the gate. The guard stopped him again and Oyama shot and killed the guard. Other Chinese guards returned fire and Lieutenant Oyama was killed in the shootout. Access to Hongqiao Airport was a violation of the terms agreed by China and Japan under the terms of the ceasefire signed in 1932. It is still unknown whether Ōyama attempted to enter the military airport. The incident heightened the tensions between the Chinese and Japanese forces in Shanghai. On 10 August, the Japanese Consul General demanded that the Chinese withdraw the Peace Preservation Corps and dismantle their defense works around the city. He also made it clear that the Imperial Japanese Army regarded the shooting of a Japanese officer as humiliating, and that any further incident would escalate the situation. In response to the incident, the Japanese began sending in reinforcements to Shanghai. 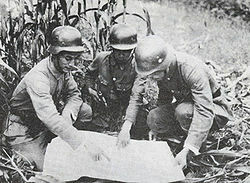 Facing the increasing Japanese military presence in Shanghai, Chinese troops were also being deployed to the Shanghai area beginning on 11 August. On August 18, Chen Cheng reached the front lines to discuss the situation with Zhang Zhizhong. They decided to send the newly arrived 36th Division into the fray, attacking the Hueishan (匯山) docks on the northern side of the Huangpu River. Meanwhile, the 87th Division broke through Japanese lines at Yangshupu, and pushed onto the Hueishan docks along with the 36th Division. On August 22, the tanks of the 36th Division reached the docks, but were not able to hold the position for long. The Chinese troops were insufficiently trained in coordinating infantry-tank tactics, and the troops were unable to keep up with the tanks. Without sufficient infantry to protect them, the tanks were vulnerable to Japanese anti-tank weapons and artillery in close quarters and became useless when they entered the city center. The few troops who did manage to keep up with the tanks through the city blocks were then trapped by Japanese blockades and annihilated by flamethrowers and intense machine gun fire. While the Chinese almost succeeded in pushing the Japanese down the Huangpu River, the casualty rate was exceedingly high. During the night of August 22 alone, the 36th Division lost more than ninety officers and a thousand troops. 36th staff officer Xiong Xinmin saw a Chinese suicide bomber stop a Japanese tank column by exploding himself beneath the lead tank. On August 14, the ROCAF bombed Japanese Navy flagship Izumo. In what became known as "Black Saturday", bombs from ROCAF aircraft fell in the Shanghai International Settlement. 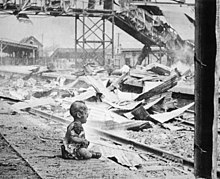 700 civilians were killed outright, with a total of 3,000 of civilian deaths and injuries resulting from the accidental release of the bombs, with most of the death occurring at the Great World entertainment centre, where civilian refugees had gathered after fleeing from the fighting. The bombing was not an intended attack on the International Settlement: the four errant bombs were intended for the Japanese cruiser Izumo, which was moored nearby in the Whangpoo (Huangpu) river, adjacent to the Bund. Two exploded in Nanking Road and two in front of the Great World Amusement Centre on Avenue Edward VII, killing an estimated 2,000 shoppers and passers-by. 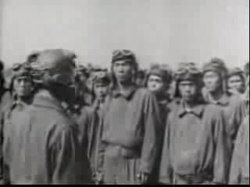 Japanese planes responded to the attack on Izumo and the 4th Flying Group of the ROCAF, based in Henan, under the command of Captain Gao Zhihang (高志航), shot down six Japanese planes, while suffering zero losses. (In 1940 the government announced August 14 would be Air Force Day to raise the morale of the Chinese populace.) From August 15 to 18, the Chinese fought the numerically superior Japanese air force in intense air battles that saw two Japanese squadrons destroyed. China was fighting the air war with every airplane in its possession, some of them purchased second-hand from various countries. It was not able to produce any planes of its own to replace those lost in combat and was always running low on replacement parts and supplies. Japan, in contrast, had a robust aviation industry able to design and manufacture technologically advanced planes and could easily make good their losses. Thus, it was impossible for China to compete in an air war with Japan. In the Shanghai campaign, the ROCAF is said to have shot down 85 Japanese airplanes and sunk 51 ships, while losing 91 of its own airplanes, which was just under half of its entire air force at the time. The perceived strength of the Chinese response resulted in major reinforcement for Japanese units. The 9th, 13th, and 101st Divisions, the 5th Heavy Artillery Brigade, and a brigade-strength mixture of smaller units were ordered from Japan to Shanghai by Imperial General Headquarters on 11 September 1937. Even though the Battle of Shanghai was only the first of the twenty-two major battles fought between China and Japan, Chiang Kai-shek's decision to send his best troops into the battle had significant repercussions. At the outbreak of the war, the Chinese NRA boasted a standing army of some 1.75 million troops, but the combat strength was significantly lower as the majority of the Chinese troops were poorly trained and poorly equipped Only about 300,000 were comparatively better trained and were reorganized into some 20 newly reorganized divisions. Of these, around 80,000 were the German-trained divisions that composed the elite units of Chiang Kai-shek's Central Army. However, even these divisions were not sufficiently supported by combined arms. Thus, out of a grand total of almost two million men-in-arms, less than one hundred thousand Chinese troops were able to fight Japan on more or less equal terms. 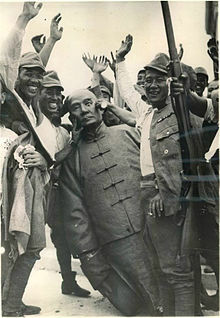 Chiang Kai-shek's decision to commit his elite divisions to fight in Shanghai caused his elite units to suffer some sixty percent casualties in the three-month bloodbath. In one single blow, Chiang also lost some 10,000 of the 25,000 junior officers trained by the Whampoa Military Academy between 1929 and 1937, in addition to some tens of thousands of potential military officers. Chiang Kai-shek's Central Army was never to recover from these devastating losses. By the time the 88th Division, arguably the best of these elite divisions, began its defense of Nanjing, it had been reduced to seven thousand men, of whom three thousand were new recruits to replace the losses. Losses to the Nationalist army's very small stock of armor were also significant. The Chinese deployed three tank battalions in the battle and its immediate aftermath. The 1st Battalion had thirty-two 2.2-ton Vickers-Carden-Loyd Light Amphibious Tankettes and some 7.5-ton Vickers Mark E light tanks. The 2nd Battalion also in Shanghai had twenty Vickers Mark E light tanks, four 5.2-ton Light Tank Mk VIs, and some Bren Gun Carriers. The 3rd Battalion had ten Panzer I light tanks, twenty L3/35 tankettes, and some Leichter Panzerspähwagen armored cars. Almost all of these were lost during the battles in Shanghai and later on in Nanjing. The heavy casualties inflicted on Chiang's own military strength forced him to rely more on non-Whampoa generals, who commanded the provincial armies and many of whom had questionable loyalty to Chiang. Because of the reduction in his military power, Chiang lost some of his political leverage over local warlords. In effect, Chiang Kai-shek was effectively only the head of a loose coalition, rather than the commander-in-chief of a united fighting force. The sapping of China's best fighting men also made the planning and execution of subsequent military operations difficult. In essence, Chiang Kai-shek's concerted pre-war effort to build a truly effective, modernized, national army was greatly devastated by the sacrifices made in the Battle of Shanghai.